I’ve had several technical founders ask for advice on building landing pages. Typically it’s bootstrapped companies that want to increase conversion rates, but don’t have the capital to hire a UX designer. In this series of articles I’m going to identifiy a common problem I see, and how to fix it. Today I’m going to give you a brief overview of Fitts’ law and how developers can improve their UX. 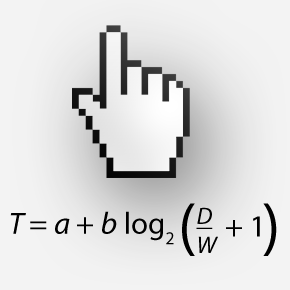 Fitts’ law can be described in the mathematical formula to the left. T is time. a is the intercept and b is the slope. D is the distance to the center of the target. W is the width along the axis of motion. Essentially Fitts’ law describes how long it takes you to point to an object. This is a pretty basic concept, but the mathematical formula gives us a framework to know exactly how to build things. Since we are looking at this through a landing page lens, the objects I will be focusing on will be buttons and links. 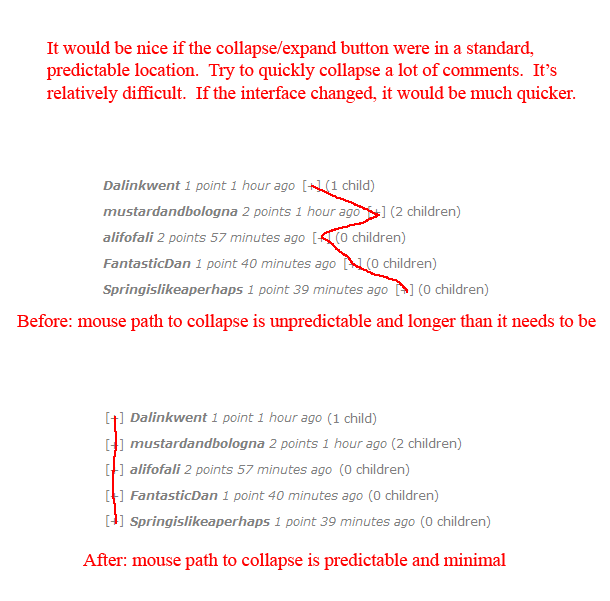 How should we design buttons and links? 1. Buttons and links are some of the most important elements on your landing page. You can improve the UX by increasing the target size. A common mistake I see is developers often build their buttons were only the text is clickable (see figure a). The rest of the button is just used for eye candy and is non interactive. 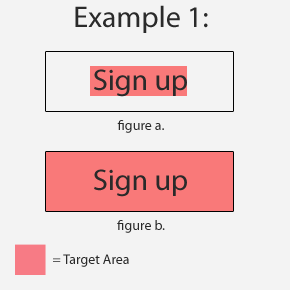 By changing the whole button to a clickable state (see figure b), you will dramatically lower the amount of time a user spends trying to click. A good UX will minimize pain points, no matter how small. 2. The next thing that we can do to improve our UX is to increase target size. The basic premise is big buttons are easier to click. For example, it’s much easier to point at a car then it is to a key. 3. The last common button placement issue I see is with button placement. Take this example from Reddit user jbu311 . Keep Fitts’ law in mind when you’re designing your landing pages to increase conversions. It’s amazing how small tweaks can minimize the amount of friction users encounter. Running a startup news site, I ask founders for hard numbers all the time. I think it’s only fair to publicly share mine once a month as well. This article is focused on the second month of TSF. You can read about our first month here. The second month was hard for me. Running a startup full-time and a side project (The Startup Foundry) is paradoxically draining and fulfilling simultaneously. Alexis Ohanian (a co-founder of Reddit) nailed it when he said “Entrepreneurship is a bipolar existence”. Traffic was up from 120,000 pageviews to 140,000 a month. 60 days ago TSF didn’t even exist and we’ve still managed to serve over a quarter of a million page views. This is very encouraging to me and I would like to say thank you to our readers. Through sponsors we’ve generated $500 in revenue this month. 1. Increased Revenue: Last month we made $462 dollars in revenue. This month I increased that number to $500. Even though it’s not a huge jump, it’s progress. The more money I generate, the more time I can spend on TSF. Slowly but surely I’m seeing this grow. 1. Article output has dipped: Situations arose in my life when I was unable to publish an article for the day. I should have had several stories in my backpocket that I could fill in the holes. 2. Better submission process for startups seeking coverage: I need to streamline this. Entrepreneurs and founders are already busy people. I want to make their life a little easier. 3. Mailing lists: Currently I have two mailing lists. The Weekly and the Daily Digest. I need to do a better job of creating value with my newsletters, and promoting them. Each month I focus on one metric to improve. This month I’m working on lowering the bounce rate. Currently we are at an 80% rate. I would like to see this number drop to about 50%. Most of the changes to TSF in this month will be addressing this issue. If you have any questions, feel free to ask in the comments. I will try to answer each one as openly as I can. Sanjay Parekh has a lot of experience with startup pitches. 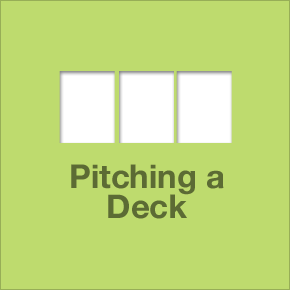 Sanjay runs Startup Riot where, once a year, 50 companies pitch their deck in a single day. He has seen the whole gamut of pitches from fantastic, to horrible, to captivating. He recently Skyped in to share with TSF readers some basic tips on how to improve your own pitch. Don’t miss this 8 minute video! This is part 2 of our interview with Sanjay. Be sure to check out part 1, “I pitched 200 VCs in 10 months before I closed the round”. 1. Don’t skip the “why” of your startup. Assume the crowd knows nothing about your startup. 2. Keep it simple. Text is fine for a document, not a PowerPoint. 3. You want to emotionally connect with the audience. 4. If you see a lot of text on a slide. Your attention shifts to the text instead of the presenter. 6. The ideal slide that complements what you’re saying (instead of speaking for you) would have a lot of visuals, but wouldn’t describe . That’s your job. 7. Create an outline before you fire up PowerPoint or Keynote. Know what direction you’re headed in before you start creating. 8. People connect with stories, not facts and figures. Focus on your narrative. 9. Adjust the deck to the audience. Why entrepreneurs and founders often have trouble sleeping: Closure. When I’m physically exhausted and craving sleep I close my eyes and I see code. Methods and variables gleefully dance on the inside of my eyelids and new ideas pulse through my veins. My brain doesn’t care it has spent the last 12 hours focused on my startup, it wants more. It’s addicted. Last night was no different. After an hour of unsuccessful negotiation with my body to go to sleep, I admitted defeat and jumped on the computer and worked so I could get my fix. After several hours, I decided to send out a quick tweet to see who else was hacking away at 3:30 am. An outpouring of entrepreneurs began to flood my Twitter timeline. I never had this problem when I was working a 9-5 job. My sleeping problems began when I started working full time on my startup. I’ve tried changing my diet, exercising more (I’m already pretty active), and Ambien without having much success sleeping. After talking with several other entrepreneurs (and my own personal experience), I believe that founders often have trouble getting closure in a work day. For most people working a corporate 9-5 job, they can checkout the second the clock strikes 5 and have little trouble leaving their “work at work” (not always true, but I’m speaking in generalities). Entrepreneurs aren’t afforded that luxury. An entrepreneur has his fingerprints all over the company and the startup often reflects much of the founders personality. I’ve found that so much of myself is wrapped up in my business that it can be hard to mentally check out at the end of the day. It doesn’t help that I had an arbitrary goal of “making it big” without any clear definition of what that actually meant. Figure out your end goal. If you could snap your fingers and give your startup success, what would that look like? After you have this big picture view of your company, break down your success into steps you can take. Then start a checklist of things you must get done each day to move you forward. Doing this helps you get “closure for the day” by reminding you that you’re actually making progress. Remember, you are a separate entity from your startup. If you have any other advice, I’d love to hear it in the comments. I don’t have this issue completely figured out, and I would appreciate additional insight. 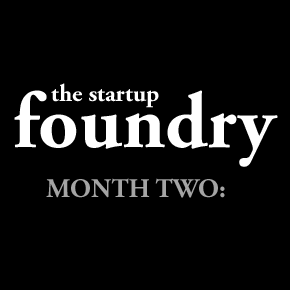 Please follow us on Twitter @startupfoundry. Author paulhontzPosted on April 1, 2011 Categories Strategy17 Comments on Why entrepreneurs and founders often have trouble sleeping: Closure.